An inspirational teacher has retired after four decades devoted to helping pupils at a top city school. The King’s School deputy head Trevor Elliott bade farewell to colleagues on Saturday at an event attended by hundreds of former pupils and parents. School headteacher Darren Ayling paid a stirring tribute to his second in command, stating: “Trevor Elliott’s career-long devotion to The King’s School has brought us professionalism, fun and companionship. Trevor has taught famous alumni such as Andy Bell, lead singer of synthpop duo Erasure, and Tottenham MP David Lammy. Trevor joined the school in 1976 as a languages teacher and assistant boarding housemaster. 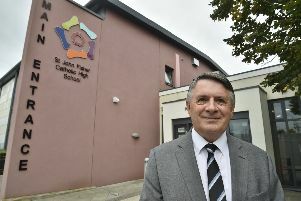 He was head of modern languages from 1979 to 1986 then appointed as deputy head aged 35, a role he has held for the past three decades, including a stint as acting headteacher in 1992 and 1993. Trevor has co-ordinated public events at the school in Park Road, including the visit of Diana, Princess of Wales, in 1991 and the Duke of Gloucester in 1993. His farewell event at the school saw him presented with a clock by former teacher Charles Conquest. Mr Ayling added: “Trevor’s success is in his stubborn refusal to see the aspects of his work as separate from each other, or to see a young person’s life as being only about school work. “It is his contribution to the welfare of the individual for which Trevor will be most remembered.